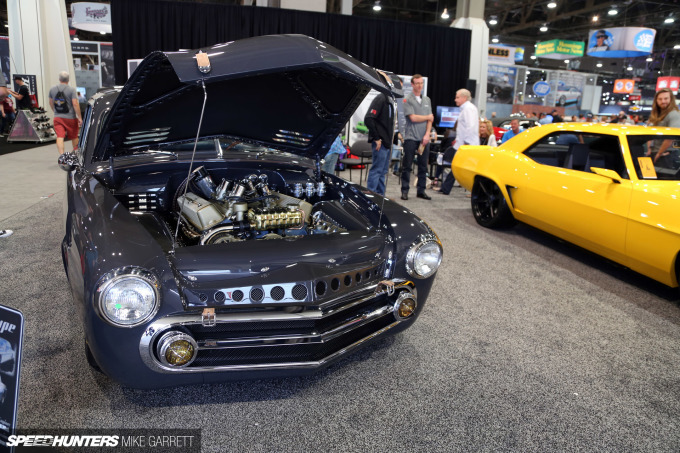 The 1949-1951 ‘Shoebox’ Ford is one of the quintessential American classic cars. Much like the ’32 Model A or the ’57 Chevy, it’s an icon. People have been hot rodding and customizing Shoebox Fords for over 60 years now, and you might think every trick in the book would have been done by this point. Not so. 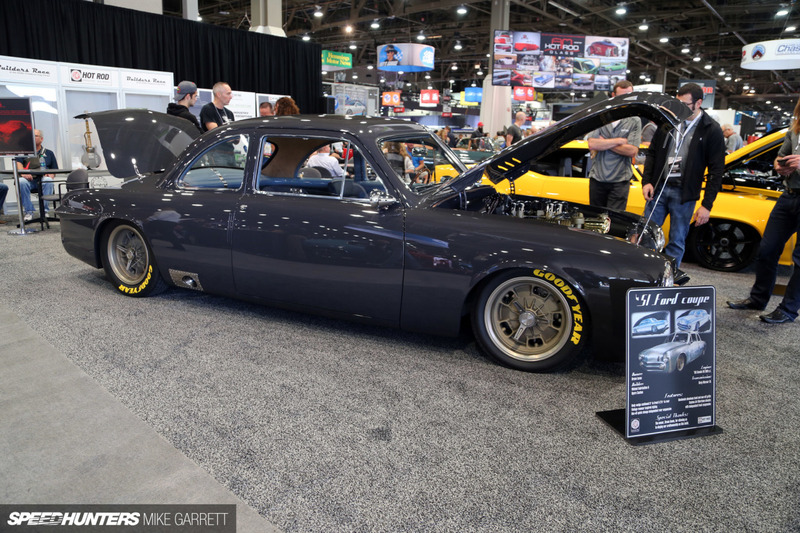 At this year’s SEMA Show, one of the downright coolest and most impressive builds is Bruce Leven’s ’51 Ford Coupe. Built by Wicked Fabrication and Byers Custom, it’s a stunning mix of classic and modern, with incredible attention to detail throughout. 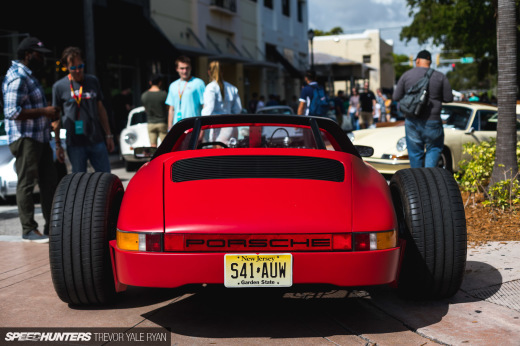 Built with a vintage racing theme, the body has been sectioned by five inches up front and two and a half inches in the rear, and it sits on a custom Art Morrison chassis with independent suspension and a quick-change rear end. There’s no modern crate engine or crazy turbo setups under the hood either. Instead, you’ll find an immaculately-detailed 368 cubic inch V8 out of a ’56 Lincoln mated to a 5-speed T5 transmission. 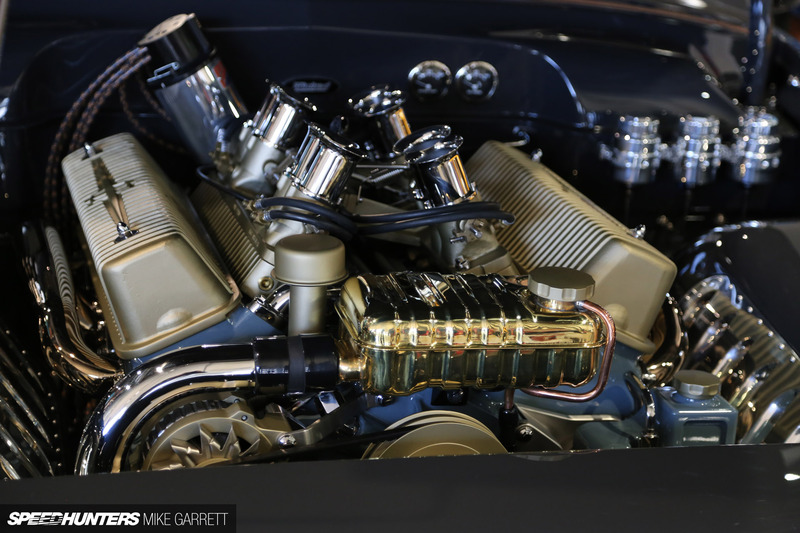 It’s easily one of the most well-presented engine bays at SEMA this year. Analog beauty at its very best. The completely reworked interior of the Ford is every bit as impressive as the engine bay. Handled by Stitches Custom Auto Upholstery in Poulsbo, WA – there are unique two-tone bucket seats, a custom center console and a wooden Nardi steering wheel to set it all off. 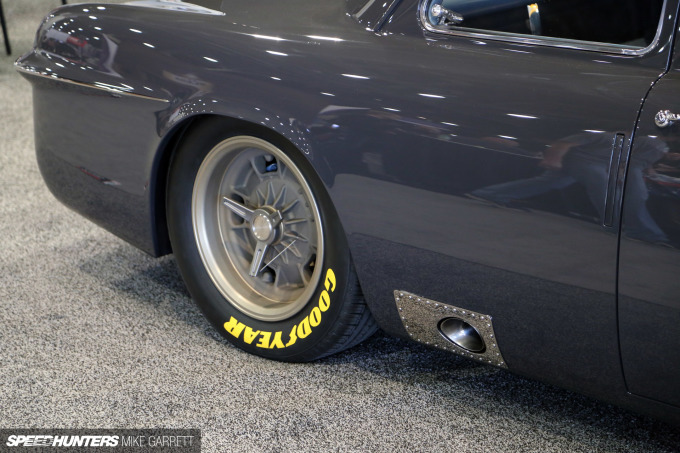 The attention to detail also extends to the trunk area which features a spare magnesium wheel and Goodyear tire to match the rest on the car. And the leather straps are another really cool touch. 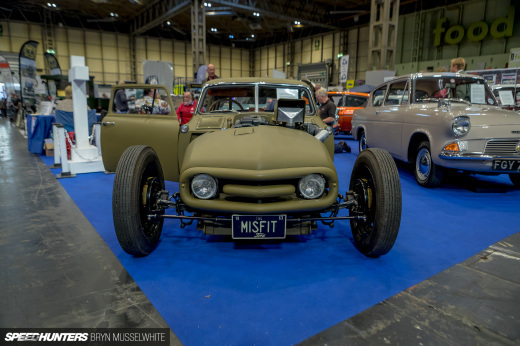 If you told somebody in 1951 that gearheads would still be customizing Shoebox Fords in the year 2016, I wonder what kind of reaction you’d get? I’m guessing they would dig this thing as much we do. 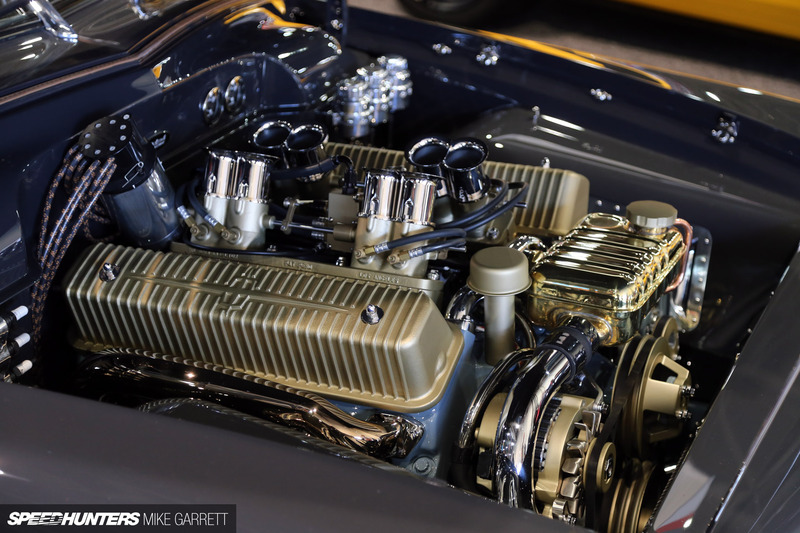 Hats off to everyone behind this project for reinventing one of the most iconic American cars of all time. I was hoping for a closer look of the shifter setup. Awesome car overall. Definitely better than my shoebox that I had years ago. My oh My that yellow chunk of beef in the last pic looks yummy!!! The heavy section without a chop looks... strange. GwynnBallantyne Safi88 I was going to say Camaro but wasn't sure. Can't see a single thing I'd want to change on that. It's perfect. I think Ive found the builder for my future 68 coronet r/t....after I win the lottery. NicholasDixon No, finally someone shows what good proportions are. This is like the classic Italian coupes of the 60's. TylerHorne When you put a T5 in older Ford's the shifter is in an awkward position. You have to reach reallllly far forward to shift. What they've done is use a linkage to move it back to a more comfortable spot. Mostly done in older Mustangs. Literal perfection. Wouldn't change a thing. Serious hats off to the builder. MickW TylerHorne I've seen a similar conversion for Crown Vic manual swaps. 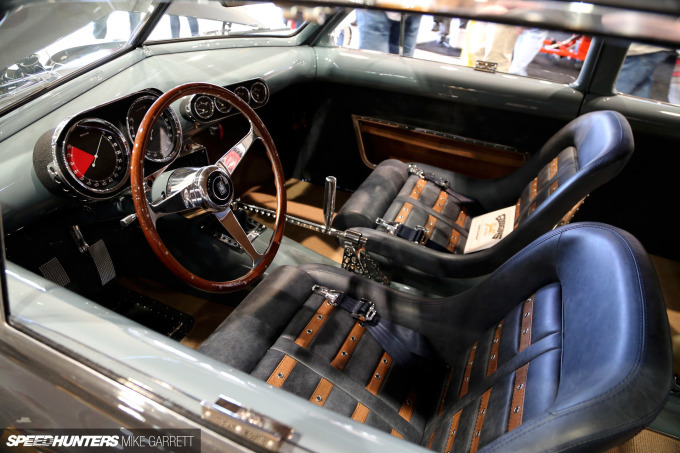 Usually just a shift lever that looks like it came off of a Peterbilt, but the Spyker looks pretty rad in this build. Love it! The through-body exhaust is awesome. This car won the GT award, so it should appear in Gran Turismo 7. Can't wait to get behind the wheel, haha! get paid $98 bucks every hour for work at home on my laptop.